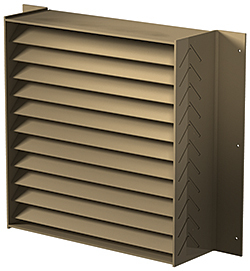 Grille protects exterior wall penetrations on FEMA 361- or 320-compliant storm shelters or safe rooms. FEMA Model AFG801 steel grille is fabricated of 0.25 inch thick hot-rolled steel and designed with inverted V-style blades. Can withstand wind loads up to 248 psf, and complies with ICC500 for large missile impact, which simulates a 15 lb. 2x4 traveling at 100 mph.